There is nothing quite like the taste of home grown potatoes, and you don't have to be an experienced gardener, or even have lots of space to get great results, so why not give it a try. 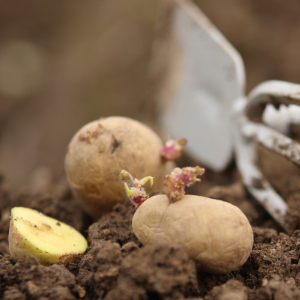 Start 'chitting' your seed potatoes by placing them in a dry, frost free area with good light. Placing them in reused egg boxes is perfect with the 'rose end up'. This is the end with the most small dents or eyes. Once your seed potatoes have shoots around 3cm, they are ready to plant. 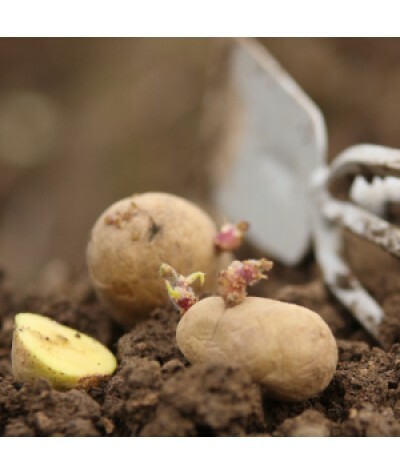 Plant your potatoes in an area that is open, but frost free with deep fertile soil that holds moisture, or if you are planting in containers, make sure the containers have depth to them to produce the best possible crop you can. A soil-based compost, such as John Innes No. 3 is ideal. Before planting, sprinkle the bottom of the drills/holes with some Blood, Fish and Bone or Growmore. Ideally plant in drills (approx 15cm deep) in vegetable beds or individual holes in containers making sure there is adequate space between them (approx 30cm). Gently cover the seed potatoes with soil and earth up to around 25cm. This protects the seed potato from light that will cause greening and from frosts. Horticultural Fleece can also be used to protect if hard frosts are likely. Place containers in a sheltered area. As soon as shoots appear above ground, cover them with more soil to protect them (this is called 'Earthing Up'). Unless there is plenty of rain, remember to water just enough to keep the soil moist (especially in containers), but be careful not to overwater as this can cause rot. Harvest time will depend on the variety you have chosen and the weather of course! As a rough guide, 'Early Potatoes' are usually ready to harvest after approx. 15 weeks, 'Second Earlies' approx. 16 weeks, 'Early Maincrops' approx. 17-18 weeks and 'Maincrops' approx. 19 weeks. Harvest on a dry day and allow the potatoes to dry on the surface of the soil for 2 or 3 hours. Handle with care to avoid bruising and store in dry cardboard boxes or paper sacks.